This week we take a look three films that exemplify some of the best gun fights in modern cinema. Today we are taking a look at Smoking Aces, The Boondock Saints and Heat. Movies that are known for being action packed and rife with exciting shootouts. Three very different plotlines, premises and good vs. evil climactic endings, but what unifies them all is good old fashioned gunfight scenes. Weather it's a group of assassins, a pair of vigilantes or a power struggle between cops and robbers, these are the three films I watch over and over again. #3 Smokin' Aces: Written and directed by Joe Carnahan was released in 2007 and starred Ryan Reynolds, Jeremy Piven and Ray Liotta with a slew of famous cameos and bit parts played by the who's who of Hollywood at the time. The plot line revolves around several groups of assassins all with the same primary target. Buddy "Aces" Israel is in some hot water and there are plenty of chef's waiting to boil this lobster. His only hope is two FBI agents that are just trying to do their job but find themselves mired in something bigger than they realized. The list of firearms used in this film are amongst some of the finest on the market as well as some scenes with some pretty interesting customs modifications. The plot line twists and turns as we focus on our anti-hero Buddy Israel and the long list of assassins hell bent on being the ones that acquire the prize. Smokin' Aces takes us on an insane journey with riotous violence brought into one scene after another. Two scenes which stand out the most in my mind are the elevator scene with Ray Liotta and the scene where the character Sharice decides to enact vengeance on anyone in the lobby of the hotel where Israel was being kept. .
#2 The Boondock Saints: Written and Directed by Troy Duffy and set in Boston was released in 1999, it became a cult classic. Starring Norman Reedus and Sean Patrick Flanery as fraternal brothers looking to rid the world of "evil men", The Boondock Saints take us on a wild ride of Irish Justice in mafia ridden America. The gun fight scenes in this film are intense and vigilant. Some would say this was our first glimpse of Reedus' more well known character of Daryl Dixon from The Walking Dead. With the help of Rocco and later their father, The Saints attempt to eliminate the corruption that has taken over their city. Twenty-one different handguns were used in this film, as well as several different types of machine guns, sub-machine guns and the list goes on. The plot line of this film is easy to follow but not always predictable making it a film that has become loved by just about anyone. The most notable firearms used in this film are those held by the two brothers and the ones used by their father in the scene where he unleashes 6 guns on his then unknown sons and their companion. Connor (Sean Patrick Flanery) and Murphy (Norman Reedus) McManus use pairs of suppressed Beretta 92FS pistols when dispatching various criminals in the film. 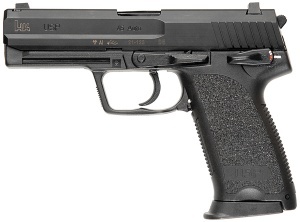 They also give Rocco (David Della Rocco) a pair of Berettas when they recruit him to their team. We see the McManus brothers use these weapons through the entirety of the film as these guns are their "go to" firearms. My other favorite shoot out scene involves the introduction of "Il Duce" and his six gun vest. 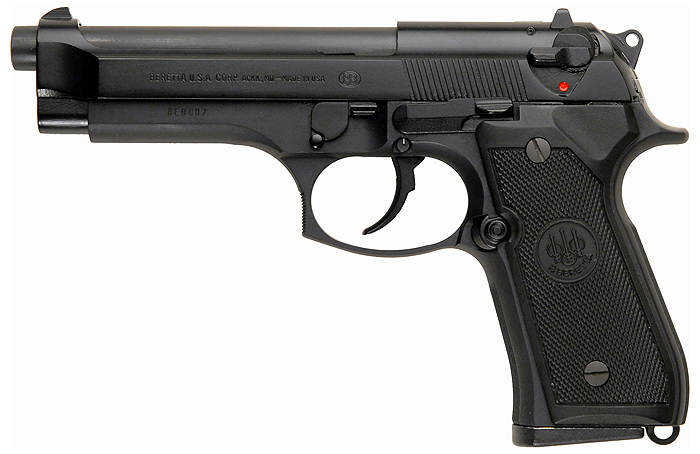 Il Duce was armed with an Taurus PT92, Para Ordnance P-14, Smith & Wesson Model 629, Smith & Wesson Model 686, Smith & Wesson 5906, and a Para Ordnance P-10. The ending of this film is by far one of my favorite cinematic endings in any film. If you haven't had a chance to watch it do yourself a favor and check it out today. The speech is truly epic. 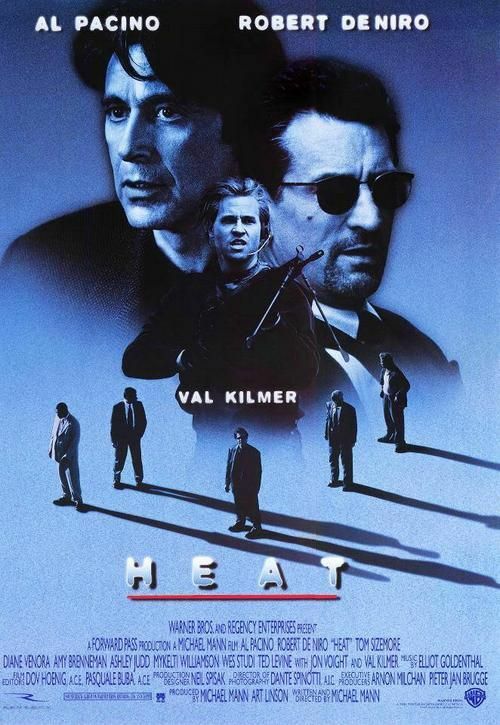 #1 Heat: Written and directed by Michael Mann this film was released in 1995. This crime drama is marked as the first onscreen pairing of legendary actors Al Pacino and Robert De Niro. Pacino stars in the film as Vincent Hanna, a lieutenant in the LAPD's Robbery Homicide Division who is determined to take down a robbery crew led by the master Neil McCauley (De Niro). This film is most well known for its detailed depiction of the techniques used by both the law enforcement and their counterpoint criminal elements. First making it's appearance as the 1989 television movie L.A. Takedown, Heat also was reported to have been viewed repeatedly by the robbery duo involved in the infamous North Hollywood shootout (depicted in the film 44 Minutes: The North Hollywood Shootout). This films influence was also the felt by Christopher Nolan who used this inspiration to make The Dark Knight. 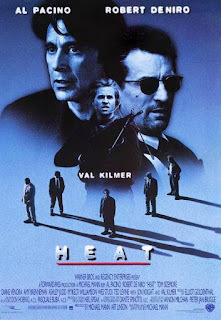 Heat has it all, a love story, a heist story and a final shoot out of legendary proportions. A realistic jaunt into the streets of L.A. and a stylish gunfight that many films emulate to this day. Some of the LAPD officers are seen armed with Remington 870s during the bank robbery shootout. A bright and methodical film we here at Cactus Tactical LOVE this film. If you haven't had the pleasure of enjoying this mastery of crime drama you need to as soon as possible. Thank you for reading this weeks Gunfights & Films blog. Don't forget to check out our social media pages ! You can find us on Facebook, Instagram & Twitter. We always have new & exciting promotions on those pages so don't miss out! Americans have gathered in the late spring for almost 150 years to honor the sacrifice of those brave souls who have served our beloved country. It began as dozens of informal commemorations for those killed in the Civil War and has become one of the nations most solemn as well as hallowed holidays. Originally known as "Decoration Day", our modern day Memorial Day has some interesting bits of history and tradition. It wasn't until the 19th century that the first commemorative events were held in the United States. But, the practice of honoring those who have fallen goes back thousands of years. The Greeks and Romans would hold annual days of remembrance for their loved ones. This included soldiers and they would festoon their graves with flowers as well as holding festivals in their honor. In Athens it was common for public funerals to take place for fallen soldiers after each battle. They would display the remains of the dead for public mourning. In 431 B.C. the first recorded public tributes to war dead occurred when the Athenian general and statesman Pericles delivered an oration praising the sacrifice and valor of those lives lost in the Peloponnesian war. Some have said this speech was comparable to Abraham Lincoln's Gettysburg Address. General John A. Logan, in May of 1968, the commander-in-chief of the Union veterans' group ( The Grand Army of the Republic) issued a decree that May 30th should become our national day of commemoration of fallen soldiers. This was called Decoration Day and Americans were encouraged to lay flowers on the graves of the fallen from wars. Legend has it the date of May 30 was chosen because it didn't fall on the anniversary of any Civil War battles but it's been debated it was chosen to insure flowers would be in bloom throughout the country. Today, Washington, D.C.'s Logan Circle and several townships throughout the nation are named in honor of this champion of veterans and those that were killed in battles. This national holiday has since been assigned to the last Monday in the month of May. It was believed that Logan probably felt the influence for these traditions from the Southern states. Prior to the end of the Civil War several women's groups were informally gathering to decorate the gravesites of the Confederate deceased. The Ladies Memorial Association of Columbus resolved in April of 1886 that they would honor the fallen annually. Some would say this decision is what influenced John Logan, his own wife would also be amongst those. Although in the South these commemorations were rarely held on any consistent day as each state would have it's own day of observance. This tradition continues today as there are 9 southern states that recognize a Confederate Memorial Day. Events are held on the the Confederate President Jefferson Davis's birthday which is also the day in which General Thomas "Stonewall" Jackson was killed. It wasn't until World War 1 that "Decoration Day" was used to commemorate all those whom served in all wars. 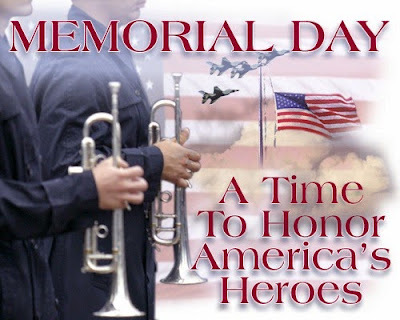 Memorial Day was not officially recognized until 1971 as America was deeply embroiled in the war with Vietnam. More than 20 different towns in America call themselves the "birthplace" of Memorial Day but one town in particular is federally recognized. The greatest rivalry has long been between Boalsburg, Pennsylvania and Carbondale, Illinois. Boalsburg bases it's claim on a gathering women who were morning their most recently killed at Gettysburg in 1864. Carbondale states they first due to a parade held in 1866. It was said John Logan himself assisted with this parade. In addition there are dueling towns in Mississippi and Georgia that have been going back and forth for decades. However, in 1966 the town of Waterloo in New York closed it's businesses for the day and took to the streets for the first continuous, community-wide celebration. It was President Lyndon Johnson that declared and signed into legislation that Waterloo be the "official" birthplace of Memorial Day. The evolution of the traditions of this holiday are vast and ever changing but some things are still at the core of this day of remembrance. The American flag should always be hung at half-staff until noon then raised to the top of the staff. In 2000 it was passed in U.S. Congress, all Americans are encouraged to pause to have a National Moment of Remembrance at 3:00 p.m. local time. This holiday has been used to acknowledge and honor non-veterans such as the Lincoln Memorial which was dedicated in 1922. We have even incorporated the Indianapolis 500 as it this marks the 102nd time the race has coincided with the holiday. All in all we've seen Memorial Day metamorphosize from it's early, quiet beginnings to being a national day of remembrance. 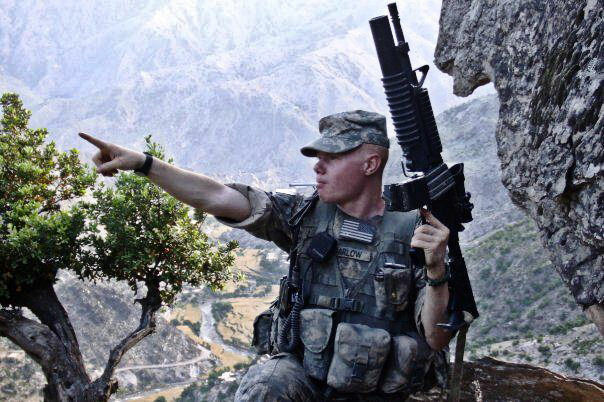 We here at Cactus Tactical salute all whom have served and continue to serve this fine country. We are truly grateful Americans. Adding an aftermarket trigger is one of the easiest improvements a person can make to their AR-15 or M-4. 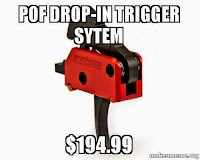 With the recent advancement to the drop-in style, a trigger can be switched out and improved in a matter of minutes. Patriot Ordnance Factory has come up with a product that is well designed and reasonably priced. Taking the easy road rarely pays off and in fact, will typically get you into more of a mess. Unless of course you are talking about fixing the crunchy trigger your AR-15/AR-10 rifle came with. That, my friends, is an easy fix. 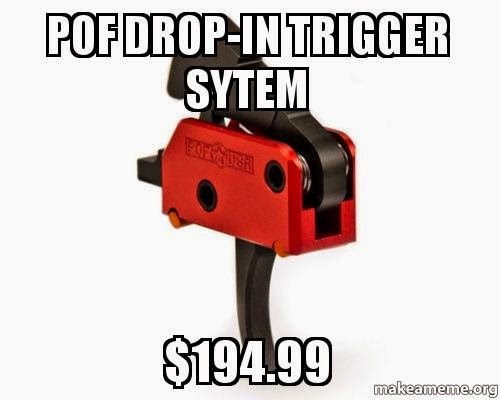 The drop-in trigger systems from POF-USA are single stage, non-adjustable complete systems that can be installed in under 5 minutes. Each system comes complete with a set of KNS Precision anti-walk pins, features American A2 tool steel components and lives in a hard-coat anodized housing. In World War 2 we saw the rise of women in the Marines and they were dubbed Lady Leathernecks. These women were such an inspiration they were visited by Eleanor Roosevelt where she referred to them as "the real women of America". In the year 1943, the Marine Corps Women's Reserve was established and the first woman enlisted was Private Lucille McClarren. Women continue to be an integral part of our Military and have a rich history in the service. In the second stanza of the Woman's Leatherneck song “We’re one for all and all for honor. And we’ll work to keep our country strong. 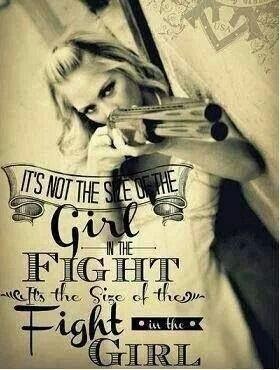 We’re the Women Marines Association. Come, Marines, and join us in our song.” they call for unity and honor. While the ladies gave it a feminine boost by adding "Lady" to the term “leatherneck” it has become a term of admiration and respect. The slang is derived from the leather stock once worn around the neck by Marines. Beginning in 1798, “one stock of black leather and clasp” was issued to each U.S. Marine annually. This stiff leather collar, fastened by two buckles at the back, measured nearly 3-and-a-half inches high. The stock was dropped as an article of Marine uniform in 1872, but by then it was a part of American vocabulary, a word preserved, like so many words, beyond its original meaning. A native of Selma, Ala., and a newcomer to Monroe, Francis Lanier was called a leatherneck. She served as a captain during WWII. 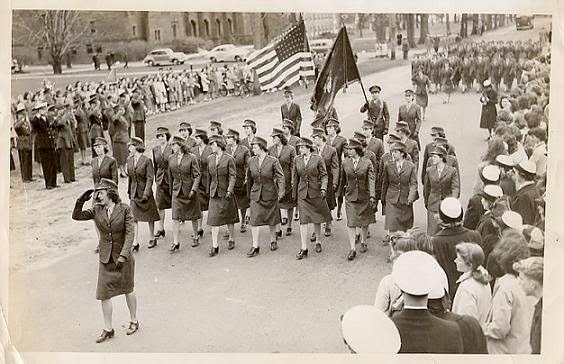 In 1943, at the age of 27, she became a Marine, entering into a proud sisterhood known honorably as the “Lady Leathernecks." She took her basic training at Camp Pendleton, Calif., and in a short time rose in the ranks to captain, company commander and PX officer at Camp Elliott and Camp Pendleton.A graduate of Huntington College in Montgomery, Ala., she qualified as the first woman candidate to enter Officer Candidate School in the Woman’s Marine Corps. She was only the third female captain and company commander of Company C, the largest of the four companies with 245 women under her command. Over the years women in the Marines have become more prevalent fulfilling roles in engineering, communications, logistics and other intregal parts of service. To learn more about the Lady Leathernecks, there is a great article here: Women Marines in History.